Trinity Farm is proud to partner with the University of Memphis to offer Horseback Riding as a PE course (PHED 1361- 2 credit hours). The course runs for 13 weeks, covers basic grooming, tacking and untacking and equitation. It is designed for a wide range of students from beginners who have never ridden to advanced riders. With our SureHands Lift, we are pleased to be able to offer the course regardless of mobility difficulties. Students must be enrolled at the University of Memphis. 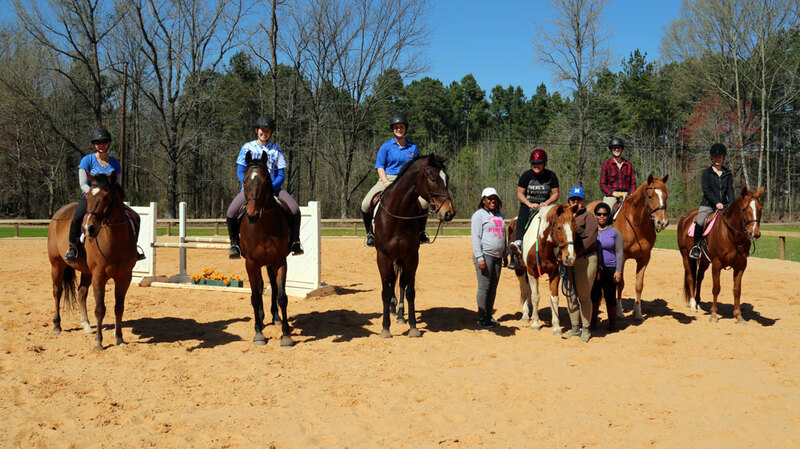 The Equestrian Club at the University of Memphis was founded in 2017. Membership is open to all levels of equestrians, whether you’re a rider or not! Our mission is to facilitate the education and growth of horse-minded individuals through horsemanship and horseback riding, forging and furthering the intricate bond between horse and rider. The club partners with Trinity Farm to provide instruction and coaching in a safe, enriching environment, so members may learn and enhance their skills on and off the horse. Club members may ride simply for their own pleasure and personal development or may choose to compete against other collegiate institutions through shows hosted and conducted by the Intercollegiate Horse Show Association (IHSA). Membership is open to all U of M students, faculty, staff, and alumni. October 3, 2017: U of M Equestrian Club (UMEC) open meeting/barn time (BT) 4:30-5:30 following the PE class. Come pet some horses, paint some poles and have some snacks. Bring a friend from campus. Featuring Costume, Parent/Sibling Leadline, Stick Horse Race and Human Dressage Test classes. Profit from the fun classes will go to the ECHO FOUNDATION. November 4, 2017: UMEC hosting breakfast at the Megford Schooling Show @ the Show Place Arena. Reach out to us with any questions at uofmequestrian@gmail.com.